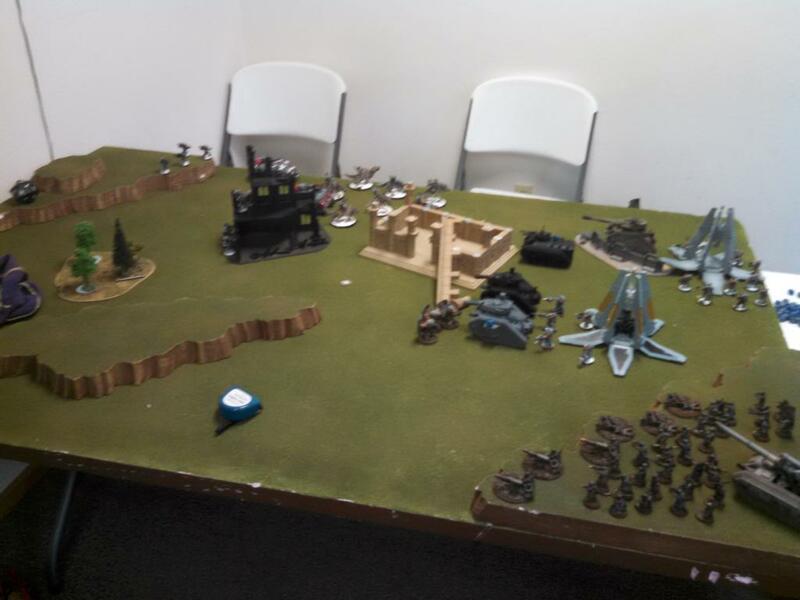 This Saturday I played in a local Warhammer 40k tournament with my Space Wolves. For 1850 points I brought seven Thunderwolves – including a Wolf Lord, two Drop Pods with Grey Hunters, a Drop Pod with Melta Wolf Guard, two Lascannon/Plasma Gun Razorbacks with Grey Hunters, and two squads of Missile Launcher Longs Fangs. There were only five attendees, so the tournament organizer played against the bye. 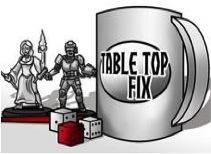 The other five armies represented were Tau, Death Wing, two Blood Angels, and an Imperial Guard. 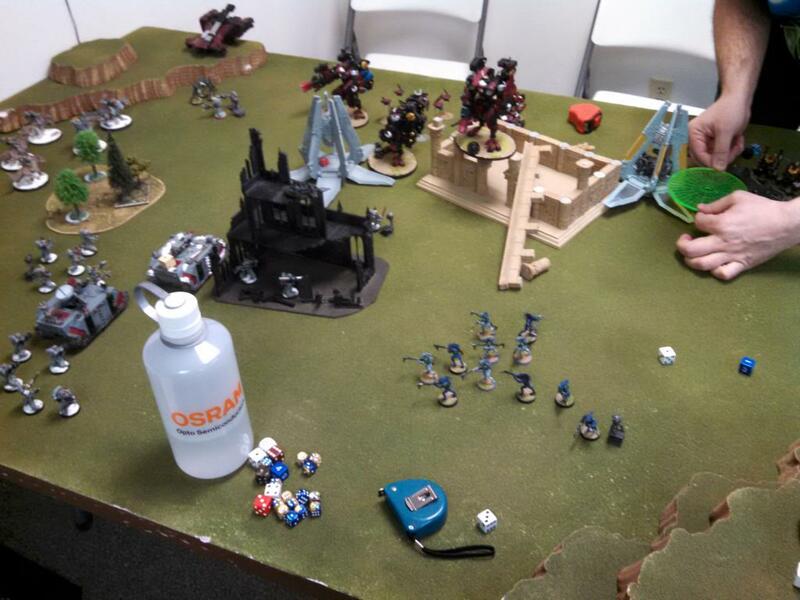 My first game was against the Tau with three Riptides, a bunch of Suits, and some Kroot. The Riptides all had interceptor, so my Drop Pods didn’t last long after arriving and my meltaguns weren’t able to do much against his army. Then I didn’t rush my Thunderwolves straight into the Tau, so he was able to weaken them up quite a bit before they reached assault. They were able to kill a Riptide, but that was it. In the end, I wasn’t completely destroyed, but I wasn’t able to hold enough objectives to prevent him from getting full points. After that I ended up with the bye. 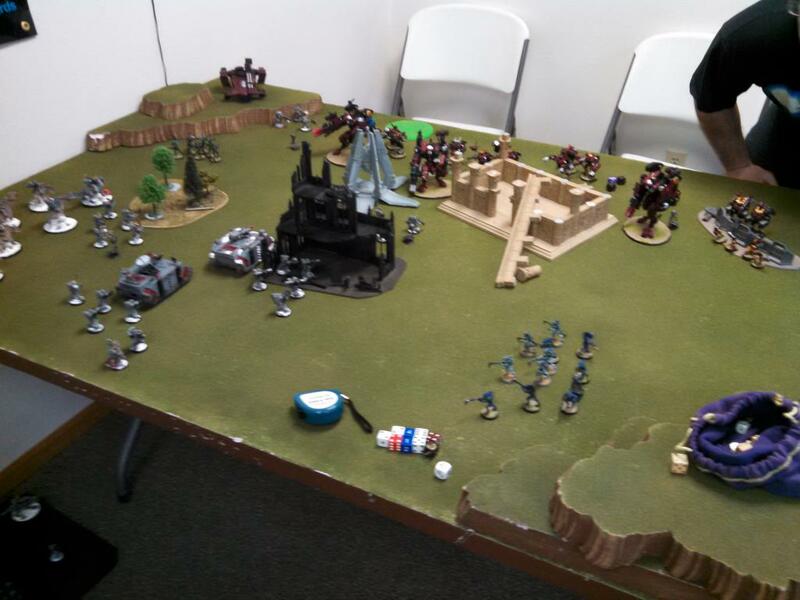 I played against the tournament organizer’s Blood Angels consisting of three Drop Pods, a Land Raider full of five Terminators, two Dreadnoughts, a Vindicator, and a fancy Landspeeder. The mission was a modified Kill Points thing, so I just needed to destroy everything. I was able to destroy the Land Speeder with my Long Fangs on turn one. My melta squads lasted longer this game, but were still ineffectual. The Wolf Guard scattered off target and then completely failed to take out the Land Raider. The Grey Hunters were more effective, with one squad dealing the final blows to the Raider and the other taking out a tactical squad. The Thunderwolves were the MVP, though. They chewed through his command squad and the terminators in assault and took out the Vindicator as well. I manage to all but table him and walked away with full points. At this point, no one was completely out of competition for first place and there were four of us within 15 points. I was matched up against the Imperial Guard with six big tanks, a large blob of infantry, a Chimera with veterans, and three Ogryns with grenade launchers. My drop pod meltas actually did their job this game and while I didn’t get the best shooting results, they were able to take out a few tanks on the turns they arrived. The problem was keeping them around. Once they landed, he would focus fire on them and pretty much wipe them out. Thankfully, this allowed my Thunderwolves to advance up the left side mostly intact. Once they hit his lines, things started to get chewed up. 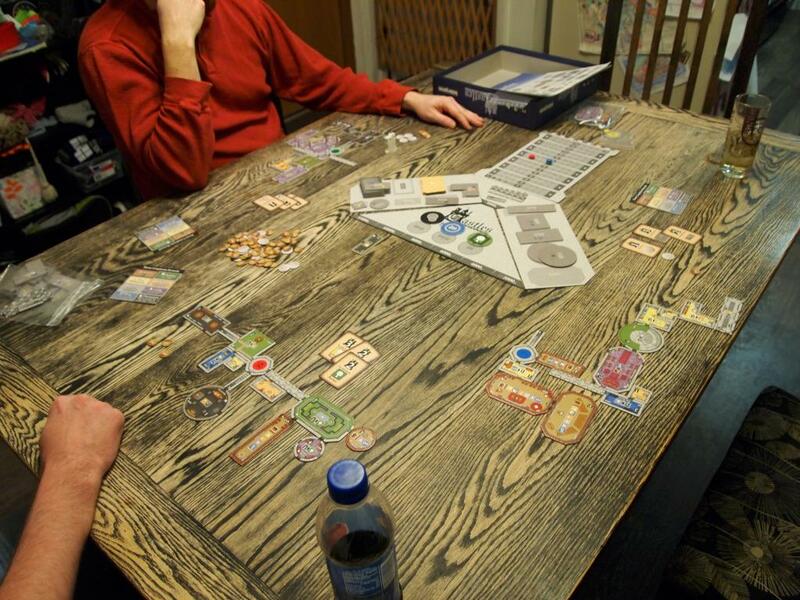 The overall objective was to take and hold a relic in the center of the table. I was able to sneak in with one of my Razorback squads and take the relic into cover on the fifth turn. I was worried when the game continued to turn six, but they held their ground and even after a seventh turn controlled the objective and there wasn’t much my opponent could do. I won the game with a majority of the points available. Overall I ended up in second place, while the Tau player took first. I walked away with a new box Thunderwolves to increase my pack. Later that evening we celebrated Nick’s birthday with his family. We played 7 Wonders with the whole group and Firefly after his parents had left. 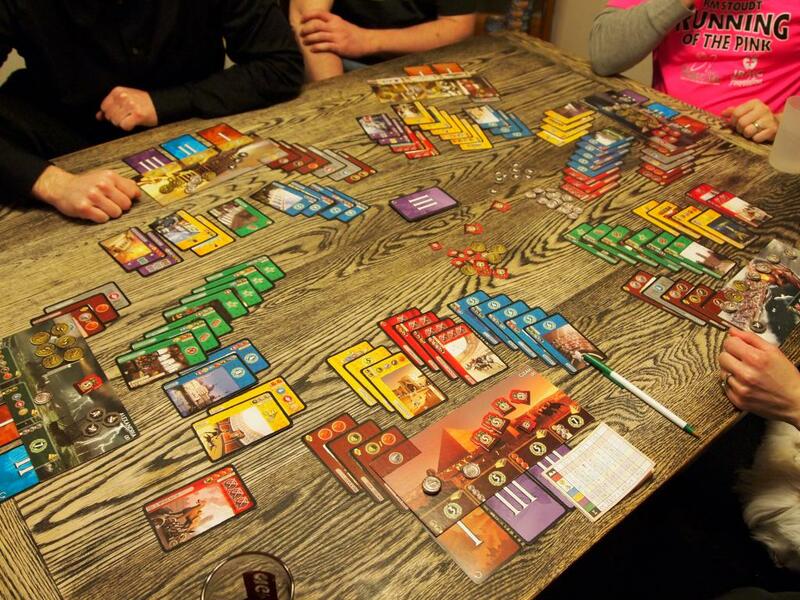 I managed to win 7 Wonders with a strong science collection. Nick won the game of Firefly without hiring a single crew member after picking up a job to transport passengers across the galaxy. He filled his cargo hold and dropped them off for a 3,000 credit payout. After that it was a quick pick-up and delivery to satisfy Harken and he was off to pay his debt. The rest of us had barely begun to get going. The usual crew of Joe, Kevin, Louis, Gina, and I were joined by Fr. Sean for games this Saturday. He was a real trooper, learning three new games and picking them up quite quickly. 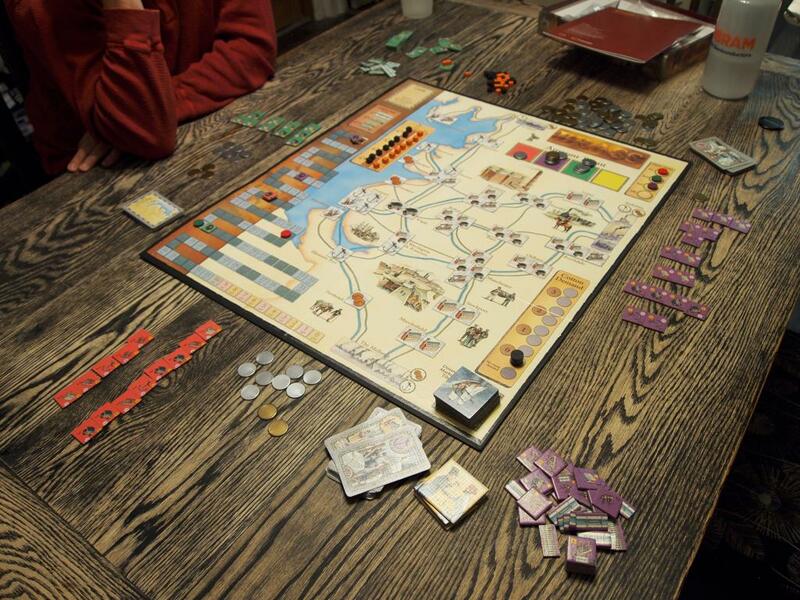 We started off with Chicago Express. I spent probably too much and bought into the Red line first. It worked alright, as Fr. Sean and I were able to get it to Chicago first and it had a very strong showing. The problem was that I was only able to get the one share, while Fr. Sean picked up two. This gave him too strong of a position on the board, and while I was helping myself I did more to help him. 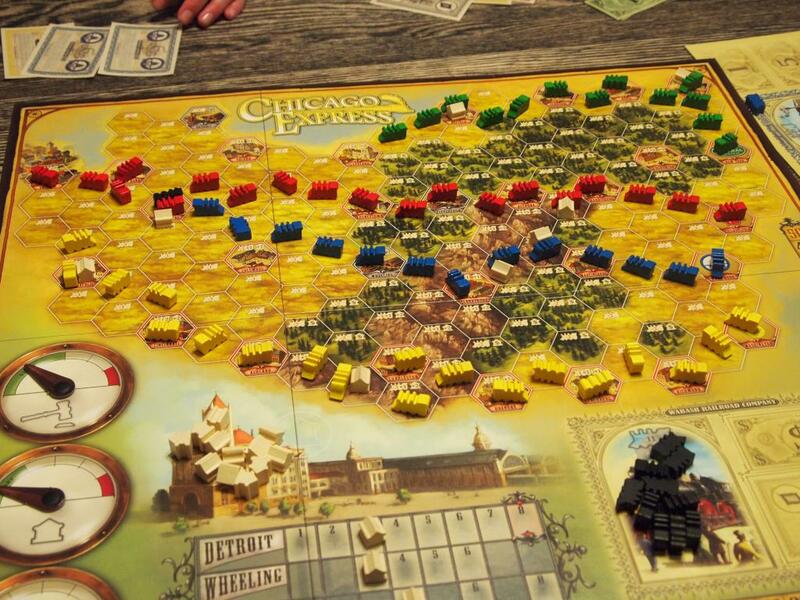 Gina and Joe were doing well, being the only players in Blue and Green respectively, while Louis and Kevin were both working in Yellow. The strong position of Red was the deciding factor in the game, and Fr. Sean took the win. 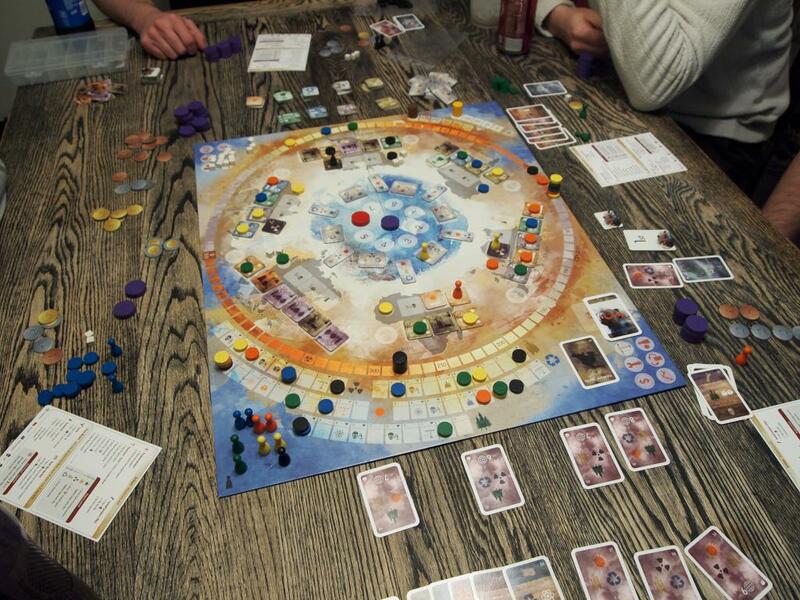 We followed that with 7 Wonders. I had Giza and I made the mistake of not ensure I had access to any paper resources. This meant that I was unable to finish my wonder or many of the other strong cards I was passed. Both Gina and Louis next to me had very strong Science collections, and while the game was close, Louis’ science propelled him to the victory. 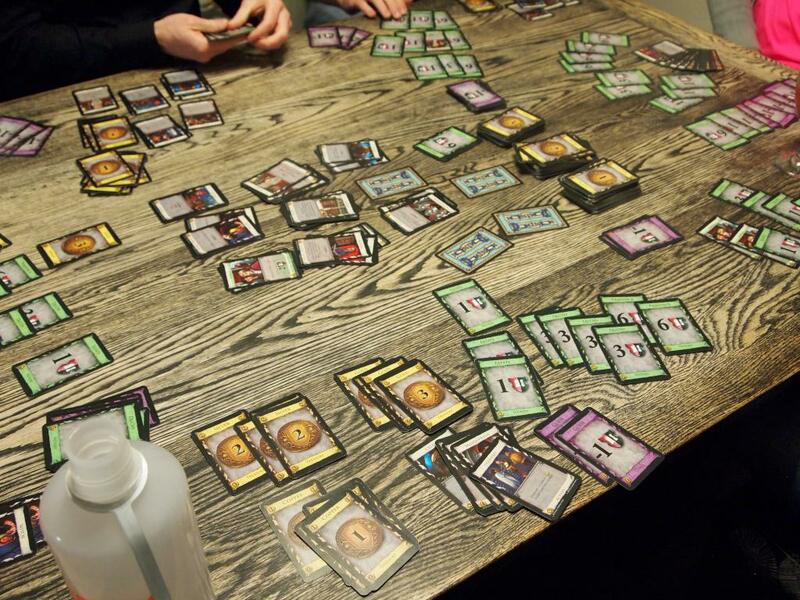 Next up was Dominion. 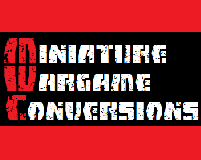 We played with the Underlings set from the Intrigue set. We thought Louis was going to run away with the game when he started comboing Festivals into multiple Witches each turn, but I was able to swing things slightly with Masquerades to pass Louis some Curses. 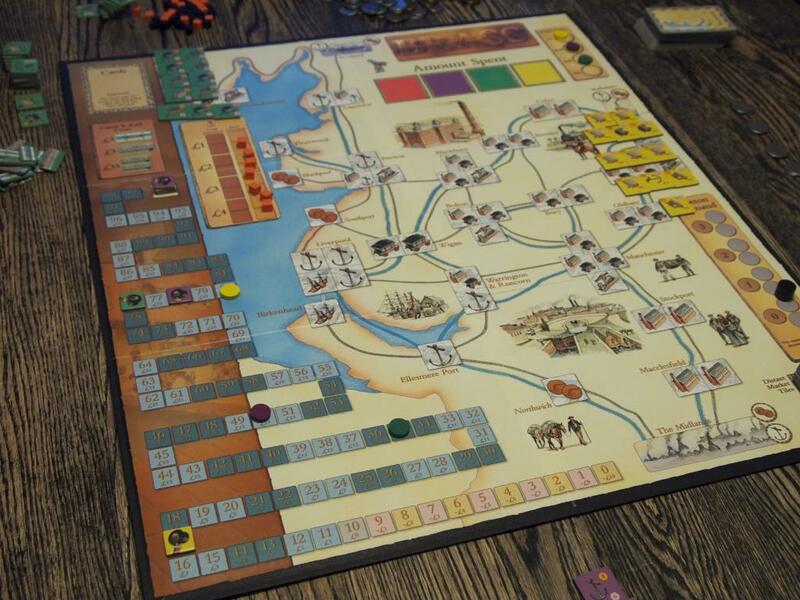 Louis also slower down late in the game as his deck became less efficient, allowing Joe time to get his engine working and pick quite a few Provinces. When we finished, Joe had the lead, despite the nine curses he had received. After that, Fr. Sean called it a night and headed home, so the rest of us finished up with Glen More. I was picking up a ton of tiles trying to use an annual fair, but not really optimally. 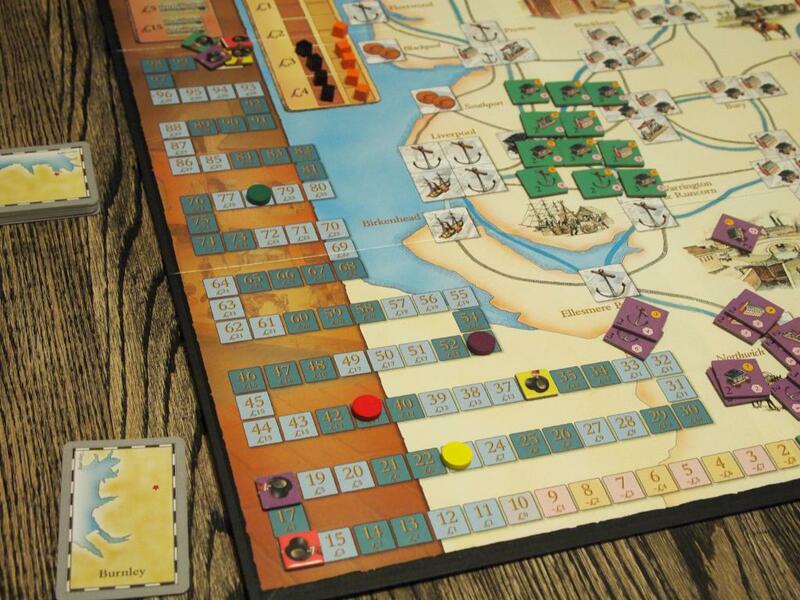 Louis had very few tiles and a bunch of whiskey that he turned into Taverns later in the game for quite a few points. Kevin had the best town, though. 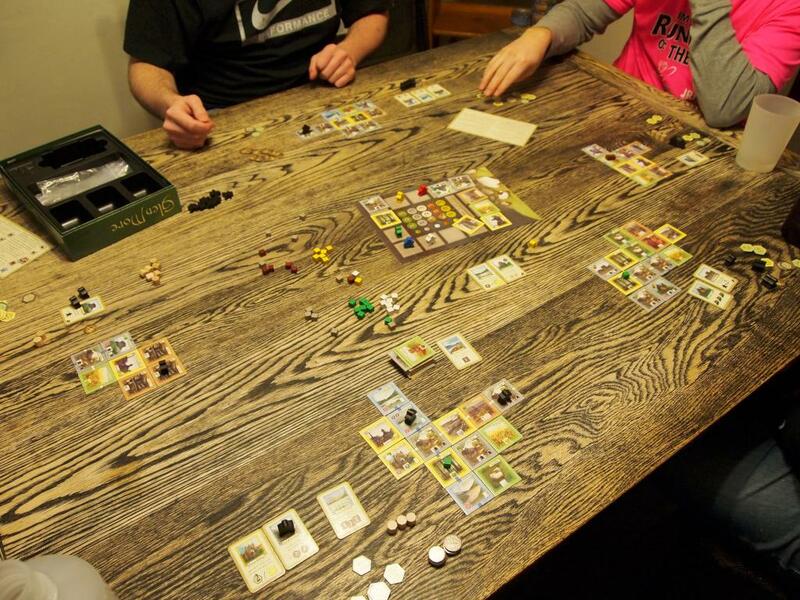 He had bonus points for his villages and was selling goods throughout the game. 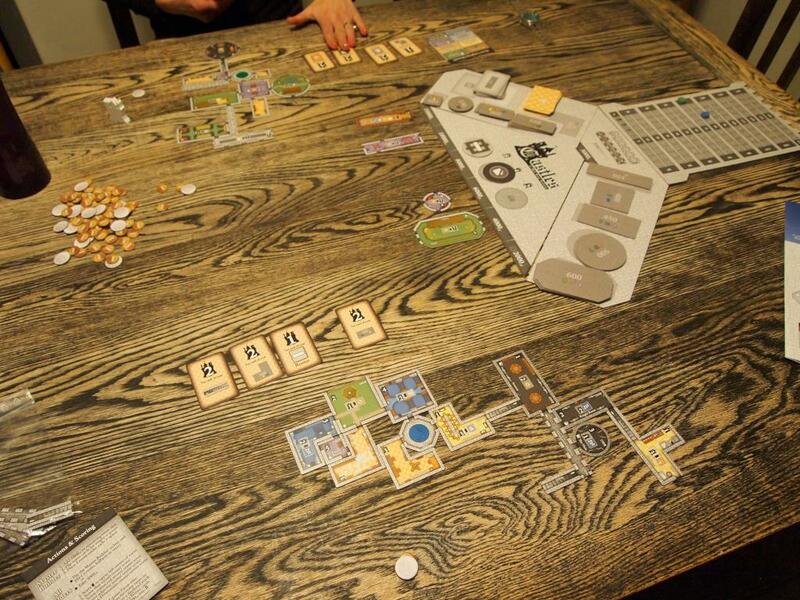 Most everyone was busy Saturday night, so Gina and decided to play Castles of Mad King Ludwig. Gina was scoring quite a from the purple rooms, but I has a nice thing going with the L shaped rooms. I managed to build every one of them so I received the bonus for the empty pile along with my bonus card for the same thing. Gina had bonus cards for nearly everything she built as well, and we split the royal favors; she won for most square footage of hallways, while I had the most basement rooms. After totaling everything up, the score was tied until we realized that the supply of stairs was also empty and needed to be scored. My extra stairs ended up being the difference. 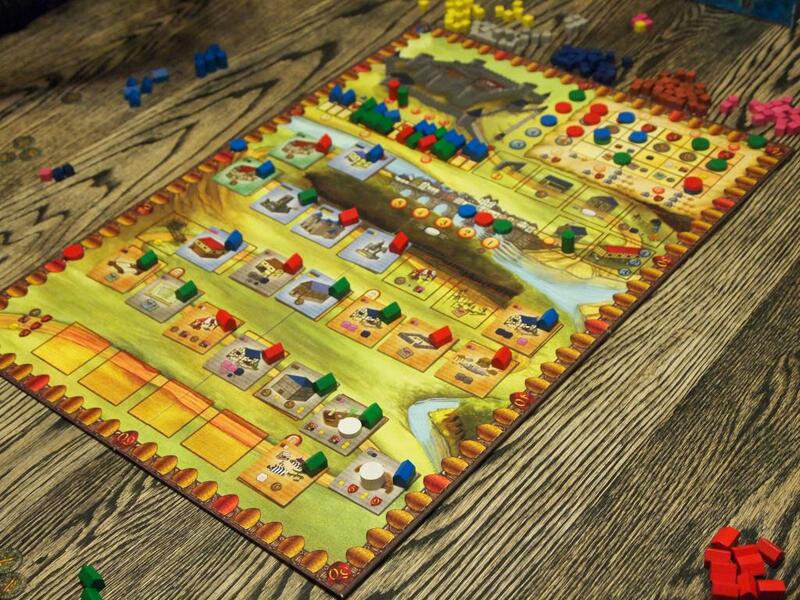 Joe was interested in a game at that point, so came over for Caylus. I didn’t really have a strong plan, but I was trying to build as many buildings as possible. I was doing alright, but had to switch things up about halfway through. Gina was focused on contributing to the castle, while Joe was jousting and taking advantage of the favors. I had stockpiled some cloth, so I began jousting in an attempt to get to the point where I could built the residential buildings. I was successful in that, but it was far too little, too late. Joe was in a position to build prestige buildings, and although I was able to build the castle, it wasn’t enough. I ended up in third, while Joe took the win. 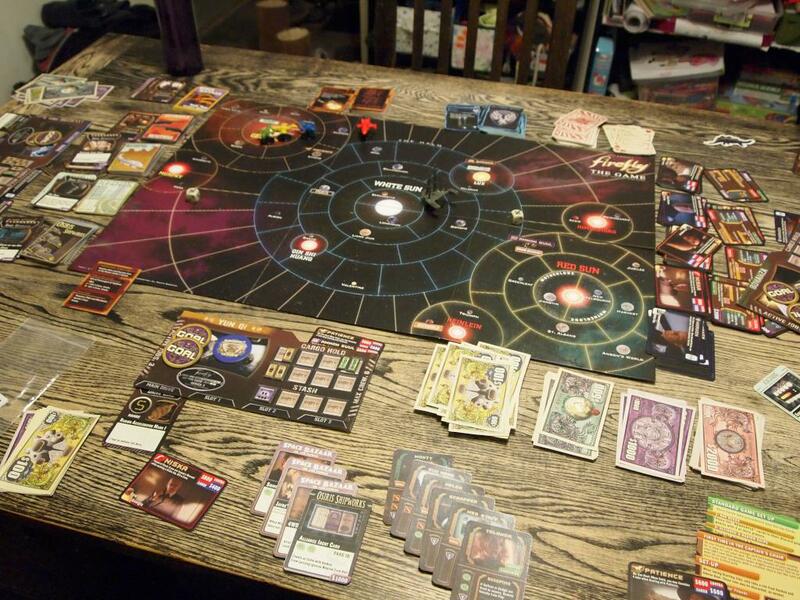 Then on Sunday, Gina, Jax, and I played my new copy of Firefly: the Game. It took a bit to get rolling. Jax didn’t want to do anything evil, so he was looking for all the legal jobs he could get. I started off with some simple deliveries before stopping at the Bazaar for goods and crew. I had a strong crew with Jayne’s Hat, a fancy tie, and a fake ID. I was ready to roll. Gina was pretty much working delivery missions, and Jax had found one crime job to do. He was having a tough time making trouble. He didn’t have a ton of resources, but he was lucky. He managed to roll two sixes in a row to complete the job, and shortly after had the funds needed to win the game. He just needed to cross the galaxy – while short on fuel – before Gina or I could turn get to Ezra to do the same. He had the advantage of turn order, and made the trip safely to claim victory. 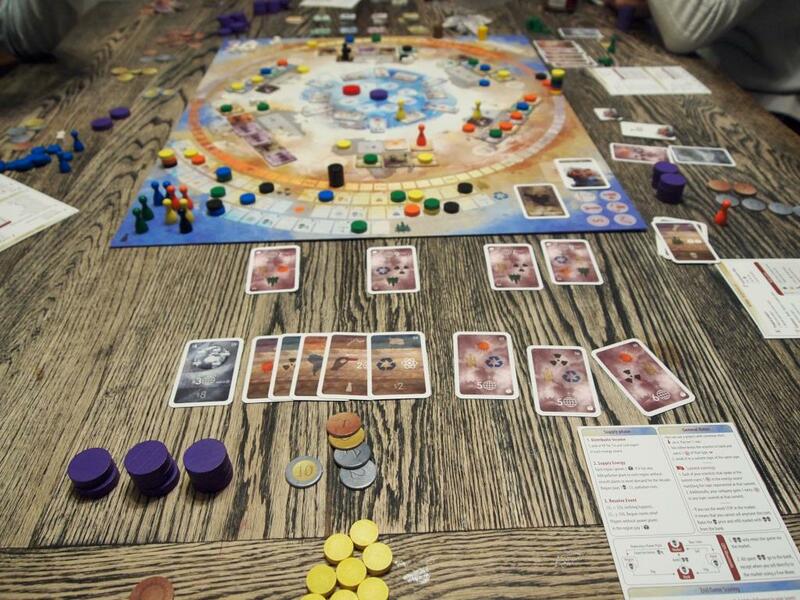 Back to gaming this weekend and we kicked things off with Gina’s choice of CO2. Things were a little dicey early with a starting CO2 level of 210 and at one point reached 490, but we were able to keep it in check. I was trying to build in as many continents as I could for my corporate goal, and managed to do fairly well there. 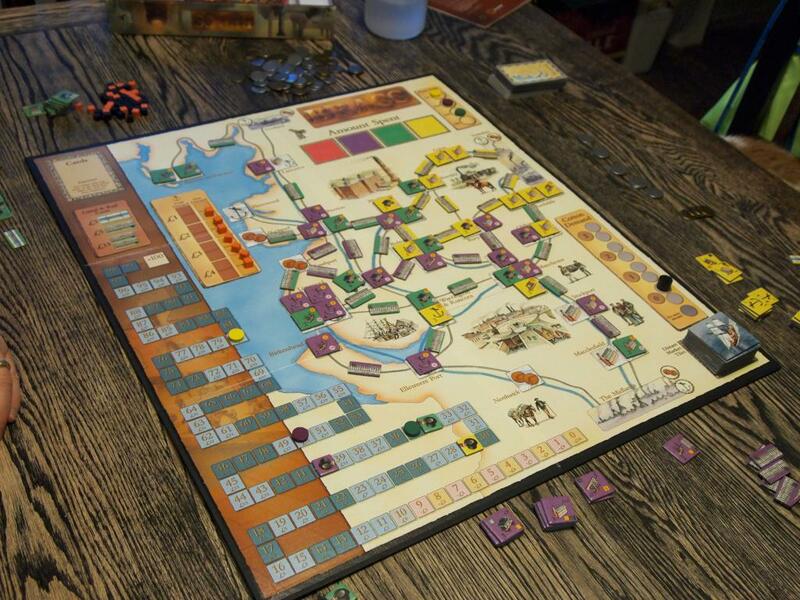 I didn’t propose many projects at all and did most of my work installing and constructing projects around the board. It was looking like Joe might take control of the game when he was picking up CEPs all over, but in the final decade I was able to take control of Oceania. With those CEPs and the three UN goals I had scored I finished in the lead. Gina headed to bed and we followed that up Five Tribes. I was just learning and was a significant disadvantage. 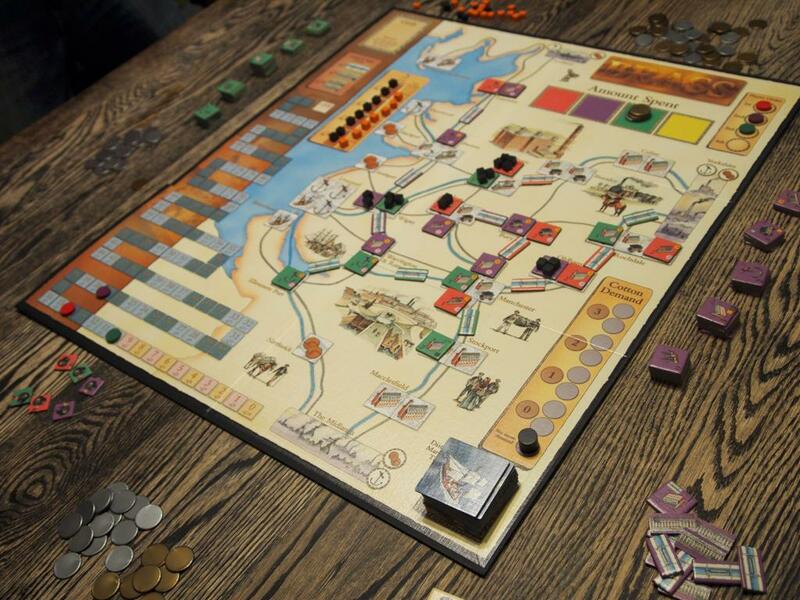 The game is highly dependent on maximizing points every turn, and seeing those opportunities. 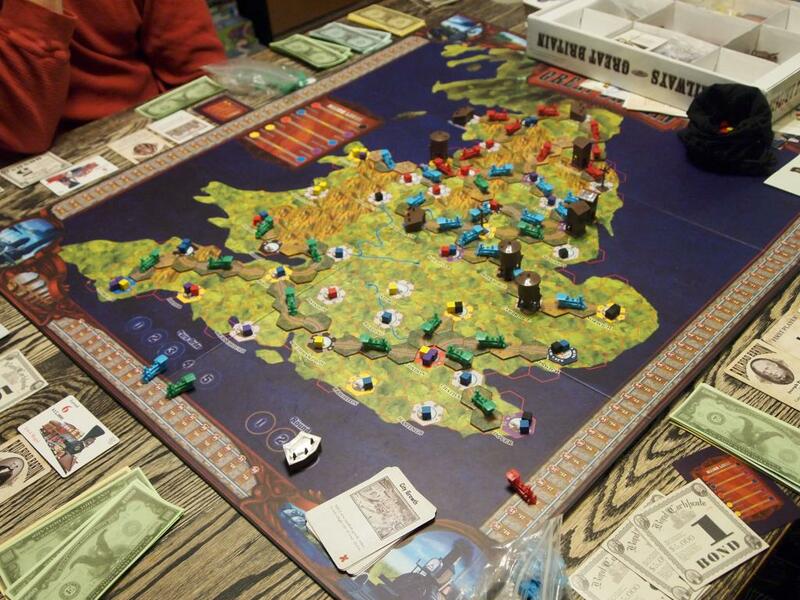 The others had played the game a few times so they were scoring a ton each round, while i struggled a bit. I didn’t place last (Joe did), which was a miracle, but I didn’t get close to Louis’ 157 point victory either. It was an interesting game, though, so hopefully we’ll get it on the table again before too long. Nick and his family were again in town and Joe joined Nick and I for a game of Brass on Saturday afternoon. I was building Cotton Mills early and often, trying to get my income up. 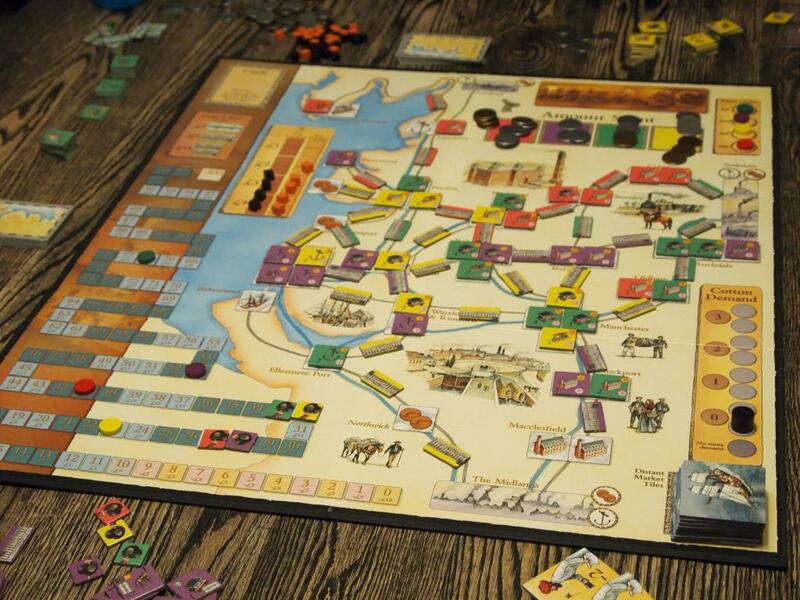 I managed to ship first to the external markets in both phases, significantly increasing my income. My problem was that’s all I was doing. Joe positioned himself to build a ton of tracks in the rail phase, while also building two boats. Nick wasn’t building many tracks, but he did have quite a few different buildings in play. During the final scoring, Joe scored 60+ points from his links and we thought he had the game locked up. Nick had 101 points from his building, though, and beat Joe by two points. Nick was in town and was able to join Kevin, Joe, Gina, and I for games on Saturday. 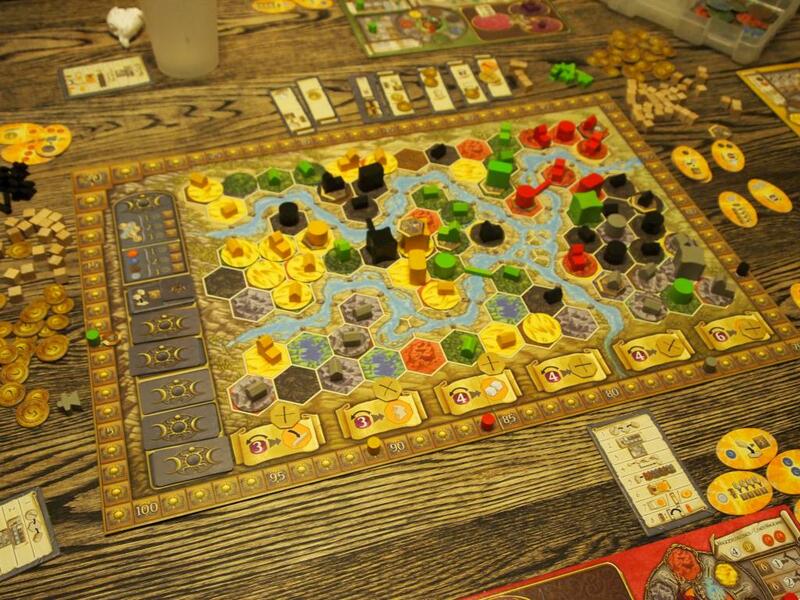 Gina selected Terra Mystica for the first game of the evening. Gina was the dwarves; Nick, the alchemists; Joe, the witches; Kevin, the nomads; and I had the chaos mages. 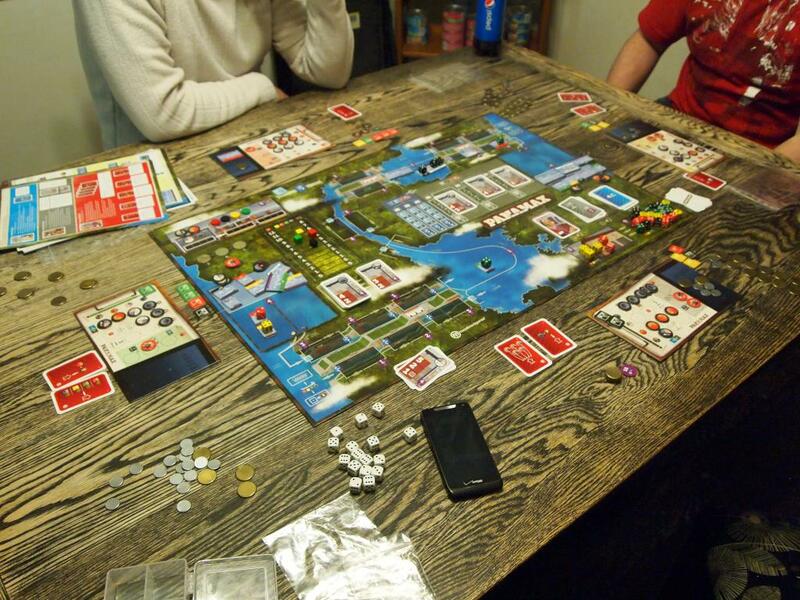 I took the upper right corner of the board and had the +1 boat tile for the first round and was able to do some quick expansion. I was working on building temples and building my favor with the cults. Joe and Kevin were spreading all over the place, while Nick and Gina were in the lower right building their towns. By the third round we all had at least one town, and Joe was working on his second. I had the upper right corner locked up and was working towards my second town, but I wasn’t able to get it completed before Kevin overtook me for the lead in the water cult. I ended up with first place in one cult, second in two, and third in the last. Joe’s three towns, though, launched him well into the lead early and he held it until the very end. We followed that with Brass, with Gina heading to bed. 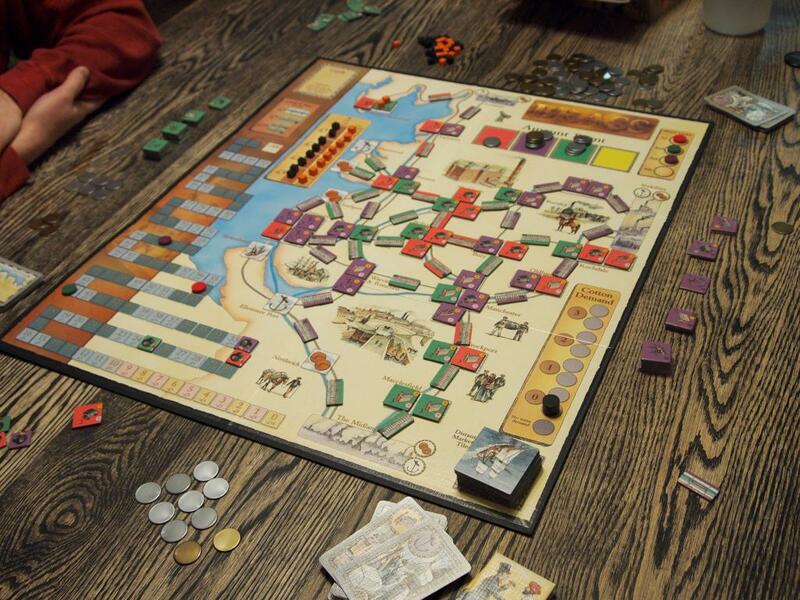 I didn’t really have a strong plan for the game, simply starting with coal mines and going from there. Joe was trying to maximize his income early with lots of coal and a bunch of early cotton mills. Kevin was just setting up for the second phase, while Nick did a little of everything. In the second phase, I was setup to build a boat in the northern-most city, so I directed my builds in that direction. Also, no one was building cotton mills, so I was able to drop a couple to take advantage of the external market for some income. Joe’s income wasn’t quite enough and he had too much coal on the board, so they weren’t emptying out causing him to struggle a bit. Kevin was building track like crazy, and that ended up being the difference in the game. Nick and I were both able to build our boats, but Kevin scored 60+ points from his links and my buildings weren’t able to overcome that difference.